The R1280DB has the classic look you love with all new features of modern powered Bluetooth speakers. The clean wooden finish of the R1280DB bookshelf speakers leave a lasting impression of elegance and luxury. The upgraded specs accommodate a standard of professionalism while improving quality and performance. The naturally fine tuned Bluetooth bookshelf speaker is enjoyable in just about any setting enhancing the style of your domestic living space. A newly refined look you love with a twist. Black wood keeps the classic look with a fresh twist on the style of modern technology. Innovation and style are important elements that accompany the feel of the R1280DB Bluetooth bookshelf speakers. Hi-tech quality and style drive the overall experience of this powerful black bookshelf speaker. Upon first glance the black wood finish gives any reviewer the impression of a sleek and stealthy Bluetooth speaker ready to deliver powerful performance.Achieve HD audio with the help of the optical and coaxial inputs which are additions to the R1280DB Bluetooth speakers. We have kept the two RCA connections for both RCA and AUX connection. Also, wirelessly connect to your phone or laptop with Bluetooth. 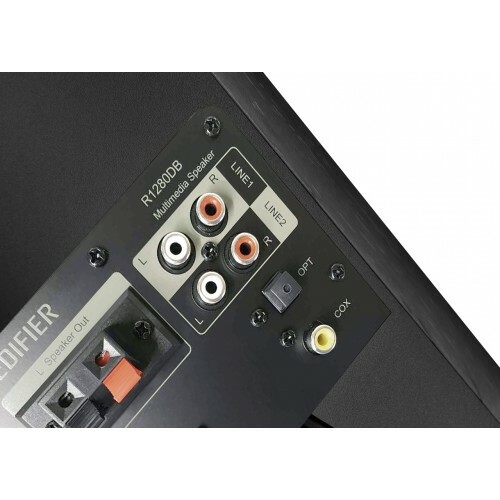 Edifier Bluetooth bookshelf speaker specs provide for the quintessential modern experience. Comprehension and control, all at your fingertips. Easily switch between inputs, adjust volume and power with the use of the remote. The features of our black remote add that extra layer of modern delight. 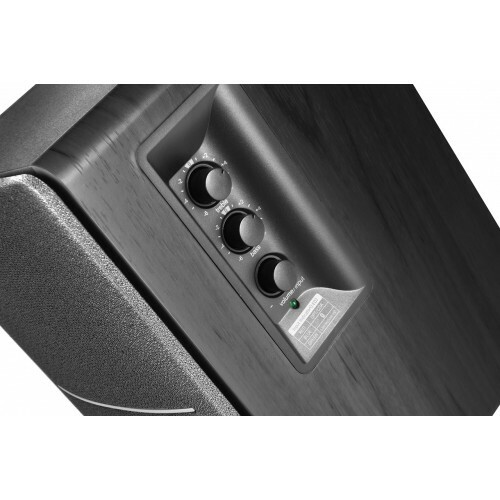 Comfort and convenience is what the R1280DB seeks to provide with inclusion of the remote. 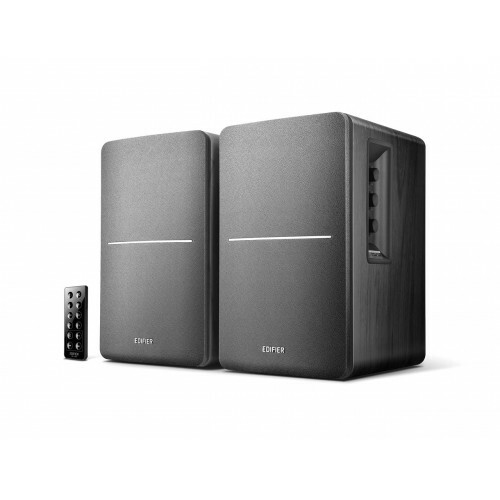 Control at your fingertips yet again, with the R1280DB Bluetooth powered bookshelf speakers.